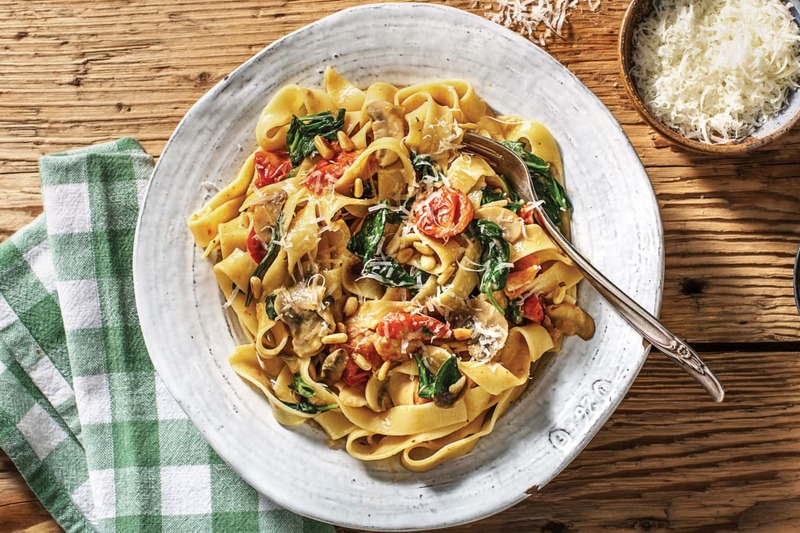 You won’t believe the delicious end result of this pasta. 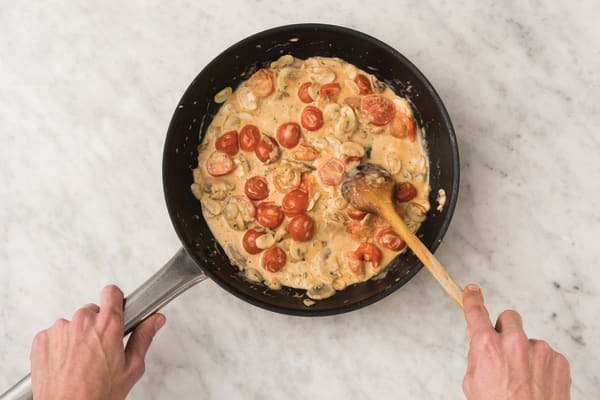 Cream and stock infuse the fettuccine with beautiful sauciness and flavour, leaving you with perfect strands of pasta covered in silky mushrooms and cherry tomatoes. Bring a medium saucepan of salted water to the boil. 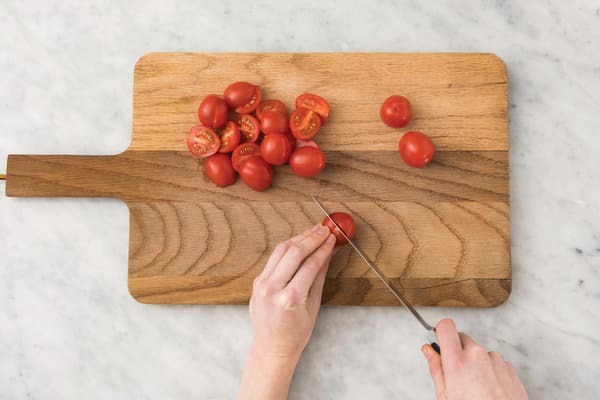 Halve the cherry tomatoes. Finely chop the garlic (or use a garlic press). Grate the Parmesan cheese. Thinly slice the button mushrooms. 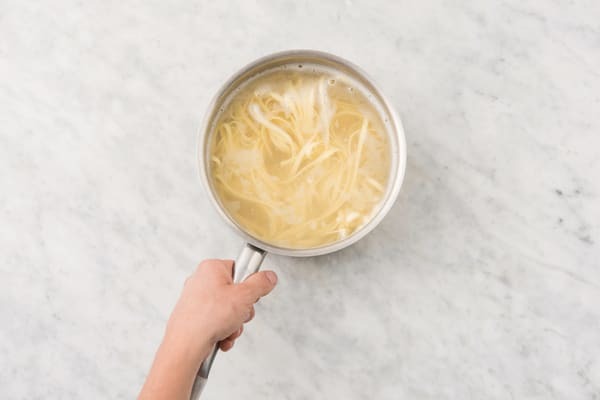 While the pasta is cooking, heat a large frying pan over a medium-high heat. 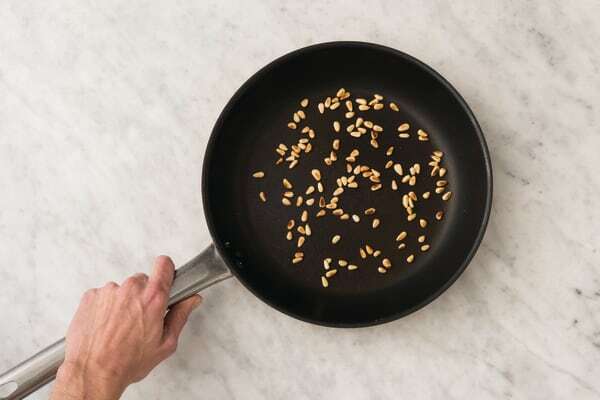 Add the pine nuts and toast, stirring, for 3-4 minutes or until golden. Transfer to a small bowl. Return the frying pan to a medium-high heat with a drizzle of olive oil. Add the sliced mushrooms and cook for 4-5 minutes, or until browned. Add the cherry tomatoes and cook for 3-4 minutes or until softened. Add the garlic and cook for 1 minute, or until fragrant. 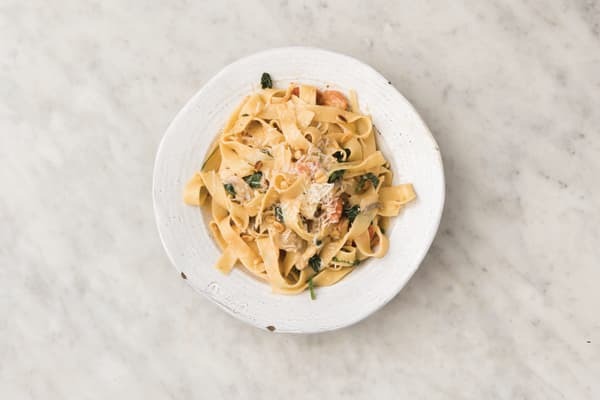 Add the pure cream (see ingredients list), some reserved pasta water (1/4 cup for 2 people / 1/2 cup for 4 people), crumbled vegetable stock (1 cube for 2 people / 2 cubes for 4 people) and 1/2 the grated Parmesan cheese. Stir to combine, then simmer for 2-3 minutes or until reduced slightly. While the sauce is cooking, pick and thinly slice the basil leaves. Once the sauce is done, add the fettuccine and an extra splash of reserved pasta water to the sauce and toss to coat. Add the basil and baby spinach leaves and stir through until just wilted. Season with a generous pinch of pepper. TIP: Seasoning is key in this dish, so taste and add some more salt or pepper if you like! 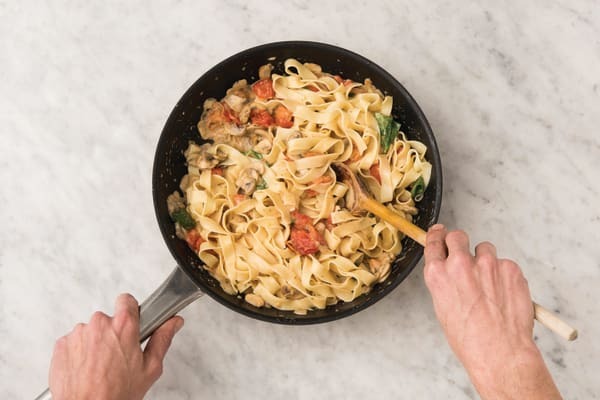 Divide the creamy mushroom and cherry tomato fettuccine between bowls. Top with the pine nuts and remaining Parmesan.